Wow, I have missed blogging. I took the month of May off without much of an explanation, so I'm sorry about that! There have just been a lot of changes going on in my life and I needed to take some personal time to step back and regroup. But now I'm back! I wanted to start this week off with something that's been very beneficial for me lately: poetrygram! For those who don't know, a poetrygram is just a fancy way of saying an Instagram account for poetry. 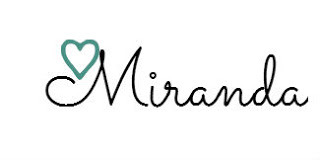 I started one anonymously a while ago, but recently changed and revamped it to be under my name and brand. My poetrygram has been the main place I have been active on lately, simply because poetry is my way of dealing with my emotions. So today, I wanted to discuss how to create a poetrygram (or a writing-gram, really, but we'll get into that) and why it's a great place to share your words. You could create a regular Instagram account if you prefer, but having the business profile is nice because it gives you access to stats about your readers like age range, gender, and times during the day when your followers are most likely to be on Instagram. Don't stress too much about your username--it can always be changed! But as you create your account, think about what kind of writing you want to showcase. For me, I originally named my account "The Voices in My Head" (which is the title of a poetry book I was planning on writing some day) and I was basically going to treat my account like an online poetry book. However, the more I began posting, the more I realized I didn't want my poetry forced to fit into one collection. 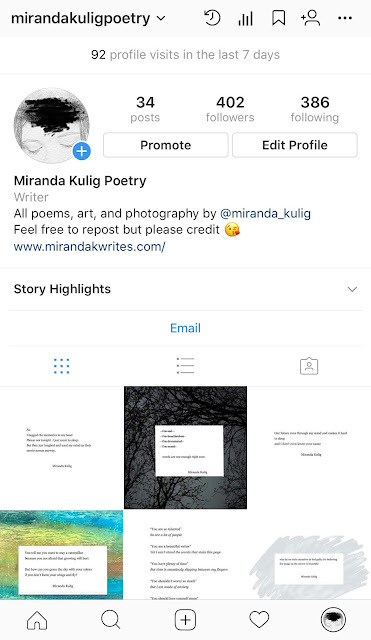 So, I changed the name to Miranda Kulig Poetry, which gave me a lot more freedom. What are you creating this account for? What do you want people to read? You could do a poetry account, short story, share bits of your novel--the possibilities are endless, really! Be as creative as you want. I decided I wanted to post my poetry as well as my own art and photography, so as you could see before my posts are generally a poem on top of art or a photo. At first, I didn't care too much about this--and you might not either--but it's still good to at least think about. If you take a look at a lot of Instagram accounts for writing, you'll see that a lot of them have specific layouts that make their account overall look very appealing and pleasing to the eye. This is very important because if your account is appealing, it will attract more readers. At first, I just posted things that I felt like posting and didn't really care about order. But after a while, my account felt very messy. So now I've been attempting to clean it up a bit and have an alternating pattern of poetry on art and poetry on a white background. It will take a bit before the pattern sticks, but I'm liking how it is so far! I've never been a huge hashtag fan on Instagram, simply because I just never think to use them. But with my poetrygram, I use as many as I can! Why? Because people follow hashtags, and using them helps me reach a bigger audience. Do a bit of exploring to see what kind of hashtags other accounts are using. Try not to use ones that no one would think to search for, as that won't help you reach an audience. Instead, use general ones like #poetry, #writing, #writingcommunity, etc. 5. Choose how often to post. Do you want to post daily? Twice a week? Whenever you can? It's up to you to decide when you want to post your content. When my account was anonymous, I used it as an outlet for emotions and therefore only posted when I was sad or emotional or needed to vent through poetry. Now that my account is a representation of myself and my brand and I'm using it to reach a bigger audience, I try to post daily with either poetry that I've recently written, or poetry I've written previously. So figure out what works best for you, and adjust if necessary. Creating a writing account on Instagram can be a little intimidating and scary. When I was first deciding whether or not to switch my account from anonymous to named, I was suuuuper nervous. I was worried I wouldn't reach anybody, that no one would read my stuff, and that ultimately, I would fail. But, I vented a little about my frustrations on Twitter and got a ton of support and encouragement to just go for it--so I did! And I am so, so glad I did. 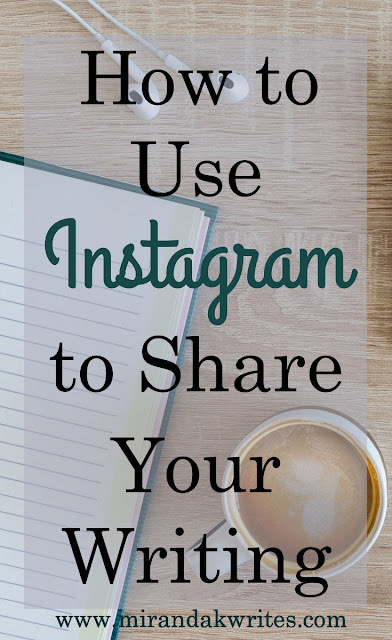 Sharing your writing on Instagram is really helpful because there is such a big writing community there. There are hundred of incredible poets to read, learn from, and support. One thing I want to stress to you is to not worry about your follower count. Please, please don't focus on that. I have been asked more than once if I had tips on gaining followers because they had seen other accounts with followers in the hundreds of thousands. While it is very possible to get that many followers, the simple truth is that a lot of accounts will buy followers and likes to increase their numbers. But since that isn't ever directly stated, it can be really discouraging to see accounts with huge followings and mediocre writing. But don't let that discourage you! Instead, focus on the followers you do have and the people who read and comment on your stuff. Comment and like back. Make friends! Don't forget that while it's easy to just post and let your writing sit, Instagram is a social media platform. Get out there and check out all the great writers! What about you? Have you ever used Instagram for writing purposes? What are your thoughts? Comment below! If you would like to check out my poetrygram, you can do so here! Thanks for reading!